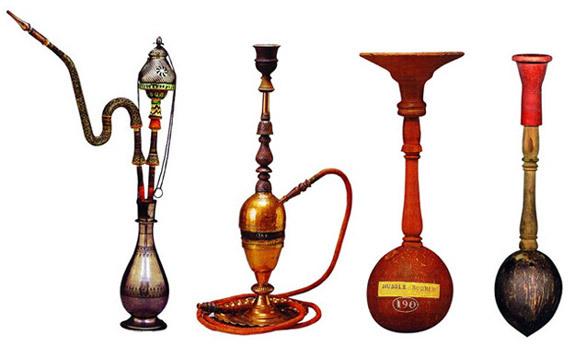 Many of the various names of the hookah are of Indian, Turkish, Uzbek, Persian or Arab origin. "Narghile" is from the Persian word nārgil, or "coconut", and in Sanksrit nārikera, since the original nargile came from India and was made out of coconut shells. "Shisha" is from the Persian word shishe, or "glass" (this is the correct literal translation, not bottle). "Hashishe" is also an Arabic word for grass, which may have been another way of saying tobacco. Hookah may stem from Arabic uqqa, meaning small box, pot, or jar. Both names refer to the original methods of constructing the smoke/water chamber part of the hookah. "Narghile" is the name most commonly used in Turkey, Lebanon, Syria, Greece and Israel, though the initial "n" is often dropped in Arabic. "Shisha" is more commonly seen in Egypt. In Iran it is called ghalyoun or ghalyan and in Pakistan it is referred to as huqqa. The origins of the hookah pipe are argued over by many. The main countries claiming to be the father of the hookah are India, Iran, Turkey, Egypt and Syria. The likelihood is the pipe in its many forms probably made an appearance in more than one country independently and through ancient trade routes started to take shape into what we now consider a standard form. Most of the worlds pipes today are manufactured in Syria, Egypt and Turkey. One of the oldest and deep rooted traditions in Turkey is the Nargile (Hookah), with both men and women finding great pleasure in smoking the waterpipe. The nargile started a whole new culture which endured for many, many years. Even today the nargile gives enjoyment to a special breed of smokers. The original hookah came from India, but it was rather primitive as it was made out of coconut shell. Its popularity spread to Iran and then to the rest of the Arab world. But it was in Turkey that the Hookah completed its revolution, and did not change its style for the last few hundred years. The hookah became a very important part of the coffee shop culture, finding its popularity in Turkey around the time of Murad the IV'th, (623-40). Not all tobaccos qualified for usage in the nargile, and only the dark tobacco imported from Iran found favor with the nargile user. This toabcco was washed several times before use as it was extremely strong. Only oak charcoal was used to be placed on the top of the tobacco. Some professional nargile smokers used certain fruit, like sour cherries or grapes in their govde just to enjoy the motion it created in the water. Other people enjoyed adding pomegranate juice or rose oil to their water for added flavor. When the water-pipe was brought to Anatolia in the 17th century, Turkish craftsmen found a new way through which they could display their skills. They engraved beautiful designs such as white or colourful flasks which appear as if they were made out of crystallized ice, or more usual designs like fruit or flowers. The hookah was so popular and fashionable with the elite ladies of the 19th and the beginning of the 20th century, that it became the in thing to be photographed with a hookah. If you wanted to be the hostess with the mostest the nargile was a must for popular afternoon tea and intellectual gatherings. Unfortunately like most wonderful things from the past, the hookah suffered a decline with the availability of the cigarettes. But still today, one is able to find a special type of smoker that would only find their enjoyment from smoking the hookah. The hookah made one of its first appearances in the western eye in Lewis Carroll's Alice in Wonderland alongside the smoking caterpillar also getting a mention in the song by the Bangles "Walk like and Egyptian". http://www.lyricsondemand.com/onehitwonders/walklikeanegyptianlyrics.html Hookah smoking has recently become popular in the United States and other Westernized countries among people who are not of Middle Eastern origin. This is especially evident in the college and university settings where hookahs are viewed as a safer alternative to cigarettes and cigars. Also, the idea of smoking hookah — less as a tobacco habit and more as a social activity — often affords it a wider appeal than that of smoking cigarettes or cigars. In fact, a large number of hookah smokers are not cigarette or cigar smokers and choose to smoke hookah because of the social appeal. Other alterations include the addition of ice to the water to cool the smoke, or the use of fruit juice or other substances (such as wine) instead of or in addition to water. Wine is only used with tobacco, as it can cause vomiting when used with marijuana. Moreover when smoking coffee flavoured hookah some people find it more enjoyable if it is filtered in milk which gives even purer smoke than if it is filtered in water. More and more Westerners are now using hookahs for the smoking of illegal drugs, such as marijuana, as they believe that the unwanted toxic parts of the inhaled fumes are filtered out. It is also highly similar to other drug paraphenalia such as a bong. A hookah's ability to produce pleasant, non-irritating smoke has lead many to believe that hookah smoking is less detrimental to one's health than most other methods of smoking tobacco, such as smoking cigarettes. Unlike cigarettes, where smoke is produced by the ignition and burning of tobacco, hookahs produce a dense, flavorful smoke by heating moistened tobacco. Research has shown that fewer cancer-causing carcinogens are produced because the tobacco is heated, rather than burned. In addition to fewer carcinogens being produced, nicotine production is reduced by the lower temperatures at which the tobacco is heated. Lower nicotine production, when compared to cigarettes, means addiction to tobacco, among hookah smokers, happens significantly-less frequently — though this may be due to cultural views and other limiting factors, such as the time required to prepare a hookah for use.